In a small to medium bowl sift together the flour, soda, and salt. Set aside. In a medium to large bowl add the remaining ingredients and mix well. Slowly mix the dry ingredients into the wet ingredients and mix well. Cover and chill ten minutes or so. Shape into balls, place onto parchment paper lined cookie sheet and flatten. Bake for approximately ten minutes, or until the edges are slightly golden. Remove from oven, keep on baking pan for one to two minutes, then place on cooling rack. 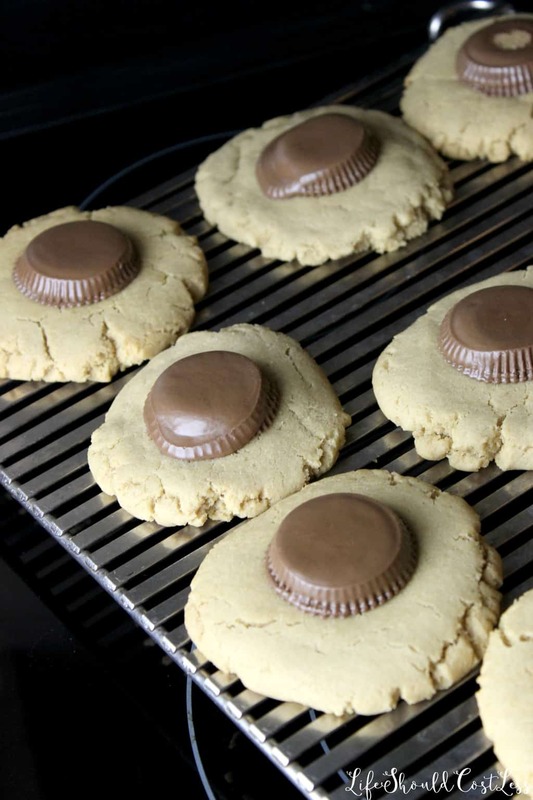 Immediately add a Reese's Peanut Butter Cup to each cookie, while they are still warm. Let sit until completely cooled and serve or store for later. These cookies freeze well so you do have the option of making early and freezing if you will be short on time.